Old Town Marbella, also known as "Casco Antiguo", filled with many shops and cafes is a must see when visiting Marbella. You were there? Please send us your evaluation and grade. We would love to hear from your family! Any visit to Marbella must include a tour of the Old Town Marbella, otherwise known as Casco Antiguo a cobblestone pedestrian shopping area filled with charming whitewashed buildings, narrow pathways, inviting cafes and plenty of boutiques. Here you will find Moorish architecture blending in with local Spanish tradition in one of the most enjoyable parts of Marbella. Evenings in Old Town Marbella are enchanting with the mix of jasmine and orange blossom in the air and the sound of flamenco music in the distance. Old Town Marbella is always bustling with tourists and locals strolling down its winding narrow roads offering many temptations to take a break at any of the quaint restaurants or cafes to relax and watch the world go by. Below we´ve created a list of the most interesting sights to see in the Old Town Marbella. Located about 10 minutes from Puerto Banús, Old Town Marbella is best discovered beginning at Orange Square - Plaza de los Naranjos - where orange trees line the main square situated just a few 100 meters north of the main road Ricardo Soriano and Alameda Park. 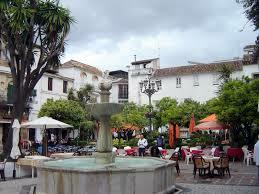 Orange Square has long been Marbella´s administrative center as well as a meeting point for locals to gather. Originally, when Marbella was under Arab rule (6th  15th century) the square was a gathering of Arab homes which were eventually demolished to make way for administrative buildings, a chapel and a main square. The square was constructed by Catholic leaders in 1485 and transformed the village into a Castilian neighborhood. If you look around the square you will notice beautiful classical renaissance style architecture, a 16th century fountain, the Town Hall, a bust of King Juan Carlos I, the Magistrate's Court and the Chapel of Santiago. It is recommended you sit for a drink or a meal in Orange Square to soak up the atmosphere and enjoy the orange blossoms while watching passersby. 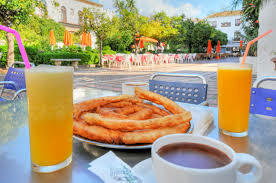 There is a lovely churros (Spanish donut-type sticks that are normally eaten with sugar and thick hot chocolate for breakfast) bar right on the square called Churrería San Ramón. If you happen to visit Orange Square in the winter you will be happy to find plenty of oranges on the trees as they blossom most in the colder months of the year. On the northern corner of Orange Square you will find the Town Hall  Ayuntamiento  built in 1568 and is a wonderful display of architecture with its antique sundial and decorative shields. In the 19th century the Town Hall served as a prison, however it has now been restored to its original structure. TIP: You may first want to step into the tourist office in the Town Hall on Orange Square to pick up some brochures on Marbella's main attractions or a map of the city. The Magistrates court Casa del Corregidor - is also located on Orange Square and is most recognizable by its lovely arches on the top floor. Built in 1552, this building is one of the oldest in Marbella with its stone façade and display of Gothic and renaissance architecture. The last important structure on Orange Square is the Chapel of Santiago  Ermita de Santiago - built in 1552. Paying tribute to Spain´s conquest, this chapel is the first one built in Marbella with its simple yet charming design and houses religious figures and a wood carving of Christ. Walking away from Orange Square down Trinidad Street and past a row of small houses you will encounter the walls from the Arab Castle that once stood here. Unfortunately, there is little left to see and there is no way to enter them, however you can still witness the ruins and the remains of the Roman capitals that have been recycled from other construction in order to build the castle walls. The wall reaches down to Portada Street where it slowly disappears. The Museum of Contemporary Spanish Engravings  Museo del Grabado Español Contemporaneo  is located on Hospital Bazán Street, named after the building itself during the period when it functioned as a hospital for the city´s poor. The 16th century Gothic-renaissance style building was originally the residential palace of Alcaide Don Alonso de Bazán, who ordered in his last will to turn it into a hospital. By 1992 the building was renovated and became the museum it is today, which not only serves as the offices of the Marbella Culture Delegation, but also houses important works of art by Picasso, Miró and Dallí. Not far from the Arab walls you head west toward Orange Square again and you will find Our Lady of Incarnation church  Parroquia de Nuestra Señora de la Encarnación  on Plaza de la Iglesia or Church Square. This baroque-style church constructed in 1505 was modified later on in 1712 and the again in 1756, when the main façade was constructed under the direction of Pedro del Castillo and Salvador Gávez. Currently the church houses Our Lady of Solitude  Virgen de la Soledad and one of the most prominent organs built in Spain for the last 125 years called the C Major organ  Sol Mayor. The Incarnation church holds regular events and mass throughout the day usually at 8:00am, 10:00am, 11:00am, 6:00pm and 7:00pm. Saint John´s Chapel - Capilla de San Juan de Dios  is located on Saint John Street  Calle San Juan de Dios - just south of the Incarnation Church. The architecture reflects the crossroads of Islam and Christianity with its mix of arches and carved doorways alongside frescoes and religious works of art. The 16th century bell tower is simple yet visible from the street below and decorates a simple stone exterior and carved wooden door with the Coat of the Order of St. John of God above. This is an interesting chapel and worth at least a quick peek inside while you are in Old Town Marbella.